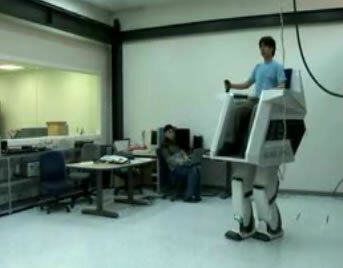 HUBO FX-1 is a robot chair - with legs - for use by humans in need of a lift. The basic idea is that humans (or up to 100 kg of stuff) should be able to walk naturally. Each ankle has a 3-axis force/torque sensor which measures the normal force and 2 moments. Each foot has an inclination sensor which measures the angle of the slope. Also, the rate gyro and the inclination sensor of the body allow the device to stabilize itself. In response to the built-in joystick, HUBO FX-1 can walk forward, backward, side-to-side... it can even turn around. On a dime. HUBO FX-1 is two meters in height, and weighs 150 kg. It appears to be powered from outside, however. 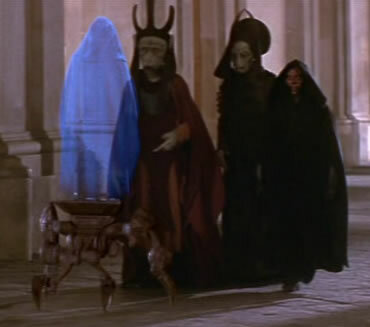 Update 07-Apr-2017: I wonder if the designers had seen the spider-like robotic chair from Star Wars: The Phantom Menace. Read more on the hubo lab website.